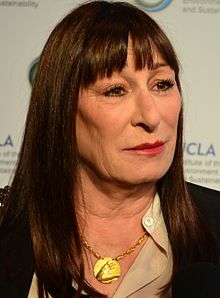 Anjelica Huston (/ˈhjuːstən/; born Julie 8, 1951) is an American actress, director an umwhile fashion model. Huston acame the third generation o her faimily tae win an Academy Awaird, when she won Best Supportin Actress for her performance in 1985's Prizzi's Honor, jyning her faither, director John Huston, an grandfaither, actor Walter Huston. She an aa received Academy Awaird nominations for Enemies, a Love Story (1989) an The Grifters (1990). This page wis last eeditit on 2 October 2015, at 19:44.